Russian Pig Price has reduced in Russia to 93 Roubles per kg. January / early February is traditionally a month where pig price falls. People have less money to spend after the traditional New Year holidays in Russia which last from 1st to 9th January. Feed raw material prices are increasing a little. As the majority of producers are fully integrated and have their own grain in store this has little effect on cash cost of production. Pig production remains very profitable. 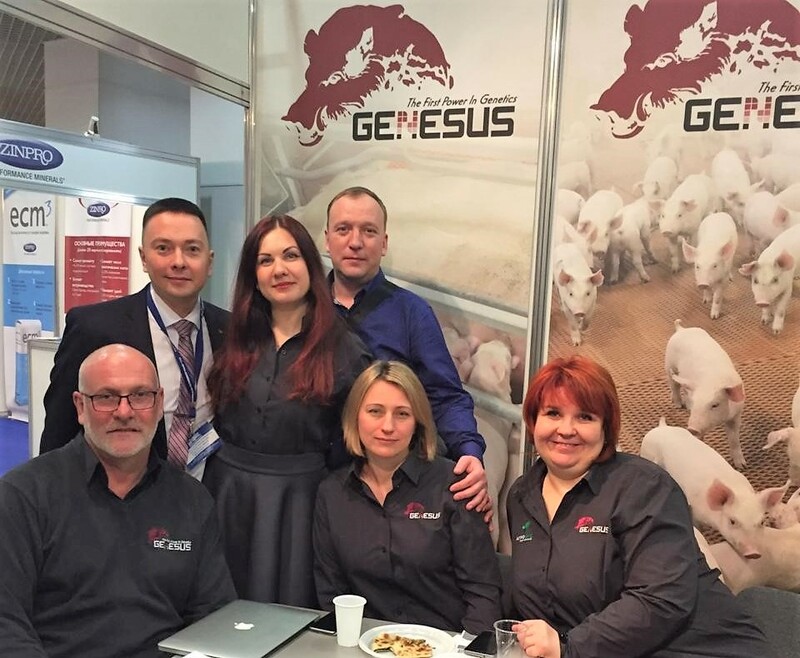 Over the past 2 weeks, there have been two agricultural shows in Moscow, that Genesus have attended along with AgroEco, who produce and sell Genesus brand pigs in Russia. Despite being held at the same exhibition centre and in consecutive weeks both shows were well attended. It is clear that new farms are being built and will continue to be built. The 2 main topics of discussion are still Russia becoming a net exporter and what the situation is in China with regards to ASF and what the likely impact will be on the market in Russia and globally. Genesus were invited to talk at a conference at the second show organised by Russian Pig Producers Association, who are very active in Russia. The subject was Global Markets and Russia as a Net Exporter. Clearly nobody in Russia really believes that the pig price will fall significantly if Russia does become a net exporter. You need only look at the table attached to this global market report to see the pig price difference between the NET EXPORTING and NET IMPORTING countries. Russians believe they will be able to sell surplus production at the high prices in China / Asia. It has not been realised that they will be competing for sales from the other net exporting countries – it is the traders in the importing countries that make good profits!! One great move forward however was in a speech by the Russian Meat Institute. It seems Russia has finally realised that is national pork quality scheme used for payment is totally out dated and no longer fit for purpose. The speaker from the institute even talked about real meat quality factors, pH, colour, marbling being included in a future standard. The last encouraging thing is the understanding of the advantage of heavier slaughter weights. 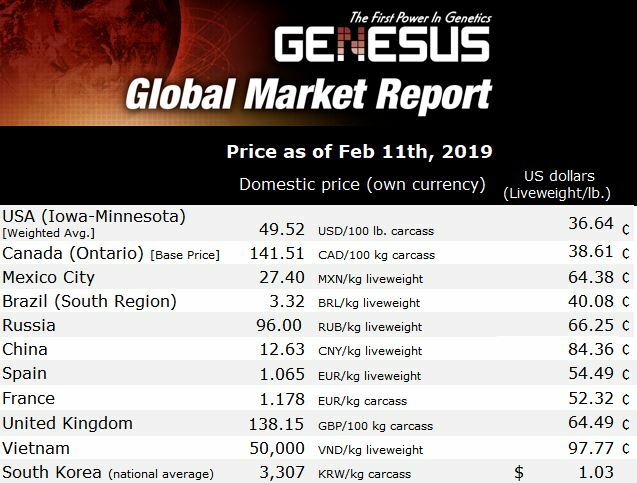 A month or so ago a Genesus client in Russia called me complaining about pigs being too fat and that he was not getting the highest price per kg. He was selling pigs at 122kg and the top price was 106 Roubles ($1.63) per kg. Discount for fatter pigs is 2 Rouble ($0.03) per kg. Told client to kill pigs at 135kg and take the 2 Roubles price reduction. 135 X 104 = 14040 Roubles sales price which is an extra 1108 Roubles extra income. Extra cost is food which is 13kg gain X 3.2 FCR X 14 Roubles / kg for food = 541 Roubles meaning extra profit is 567 Roubles ($8.72) per pig extra profit. Now a very happy client. Incidentally asked for feed intakes from the farm to see how much the pigs were eating. Many nutritionists in Europe and Russia can’t believe the feed intake of Genesus pigs especially for pigs over 100kg. If feed intake is underestimated, then energy will be over supplied and of course pigs can get fat!